In Sandy's Wake, Flood Zones And Insurance Rates Re-Examined It's been a year since Hurricane Sandy knocked the mid-Atlantic states for a loop. Scientists say that as sea level rises, such storms are likely to occur more often. But the new, more realistic flood maps could boost flood insurance rates. Will politics trump science? Neighbors in the Rockaway section of Queens, N.Y., survey homes and businesses destroyed by Superstorm Sandy on Oct. 30, 2012. 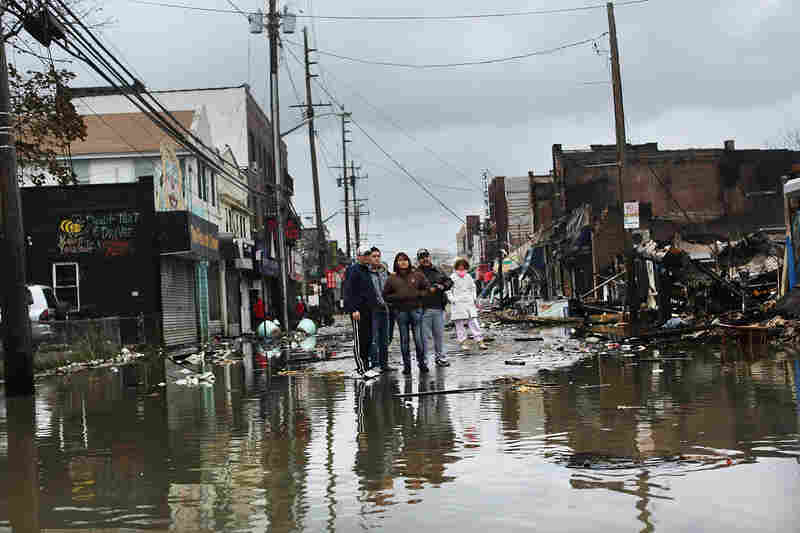 A resident traverses flooded streets as cleanup operations begin in Hoboken, N.J. The storm surge triggered deep flooding in low-lying neighborhoods. 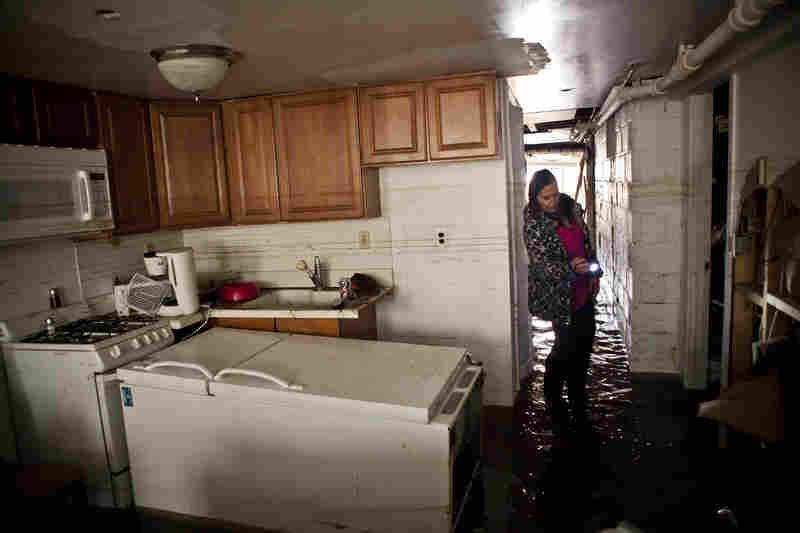 Jackie Hoey inspects the first floor of her Long Beach, N.Y., home, which experienced heavy flooding. 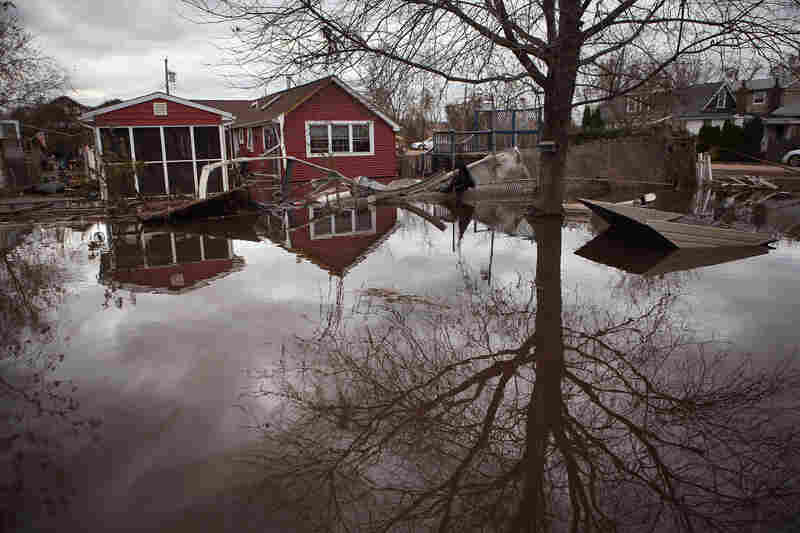 In the Ocean Breeze area of Staten Island, water continued to flood neighborhoods on Nov. 1, 2012. Most homes in the seaside community were inundated by the ocean surge caused by Sandy. 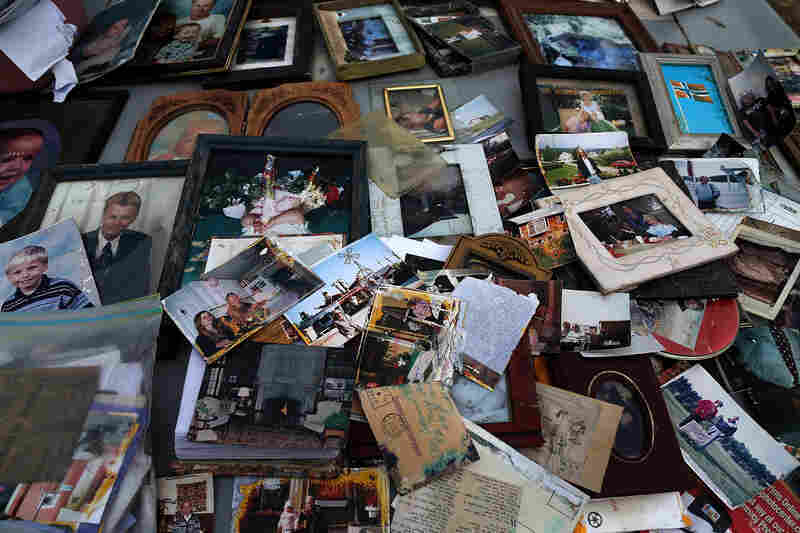 Old photographs are laid out on a car hood to dry after being removed from a flooded home in Seaside Heights, N.J. At the time, New Jersey Gov. 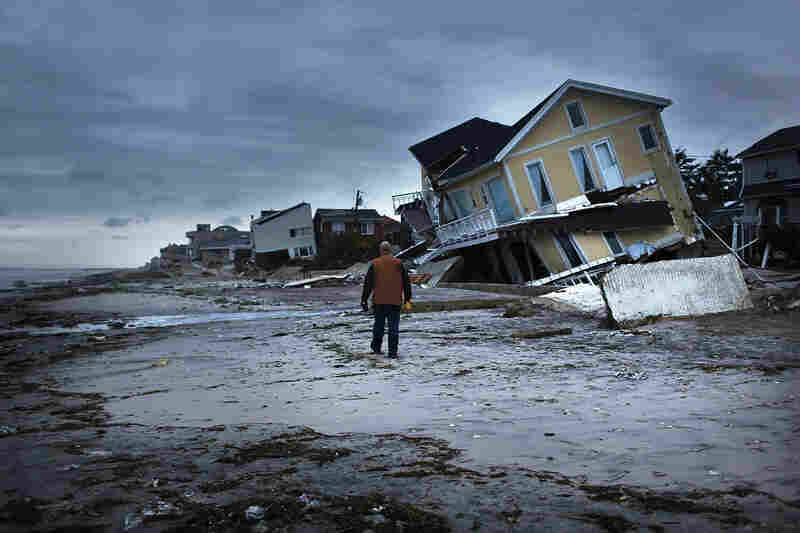 Chris Christie estimated that Superstorm Sandy had cost his state $29.4 billion in damage and other economic losses. 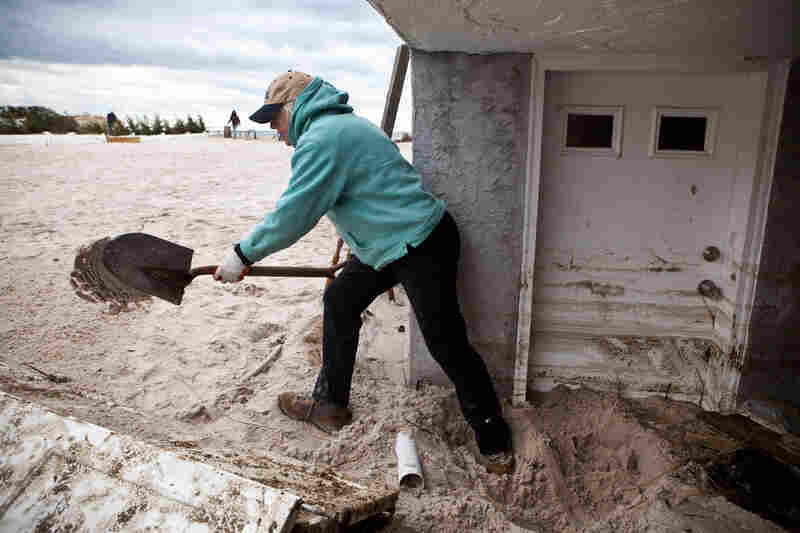 Sand marks the floodwater line on the side of a house in Long Beach, N.Y.
Barbara Young tosses sand out her front door in Long Beach, N.Y. 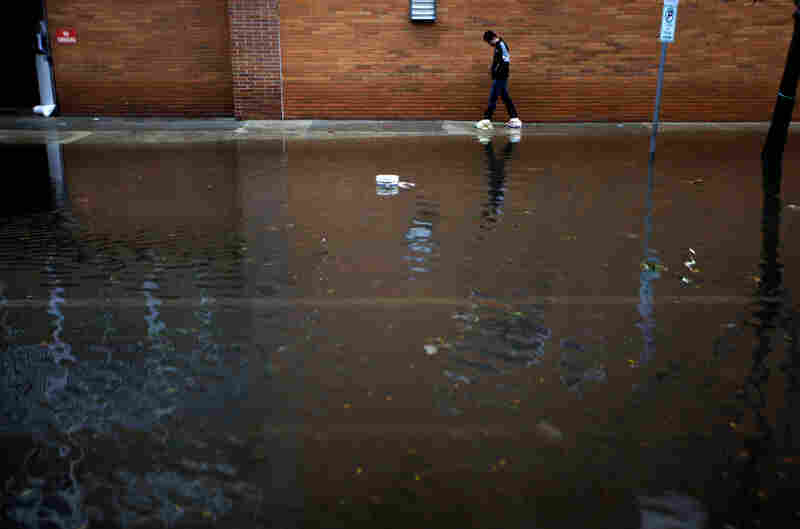 The storm caused massive flooding across much of the Eastern Seaboard. 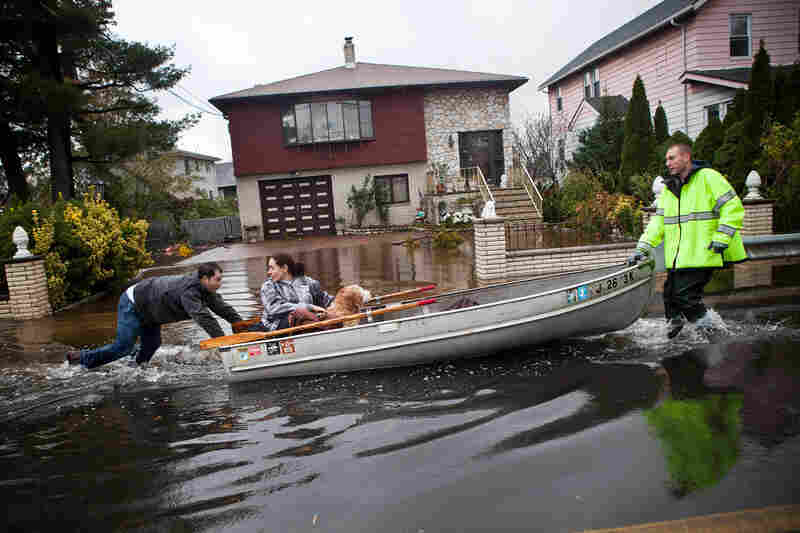 An emergency responder helps evacuate two people with a boat after their neighborhood in Little Ferry, N.J., was flooded. In one Rockaway neighborhood the historic boardwalk washed away during the storm. 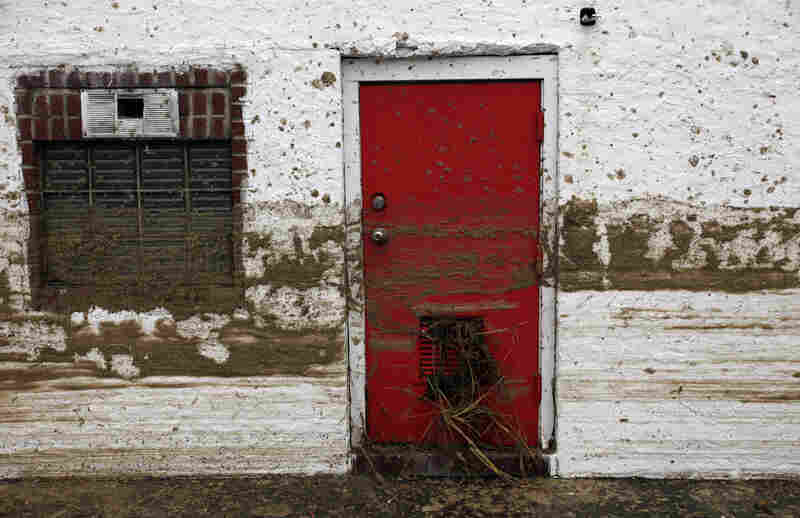 When Sandy blew into East Coast communities a year ago, it was flooding that did the most damage. That's in part because the average sea level has risen over the past century — about a foot along the mid-Atlantic coast. That made it easier for the storm to push the ocean onto the land. And scientists say there will be many more Sandy-style storms — that is, torrential rain and wind that create heavy coastal flooding — and they'll be more frequent than in the past. But preparing people for that means changing the way they live, and that's proving politically difficult. 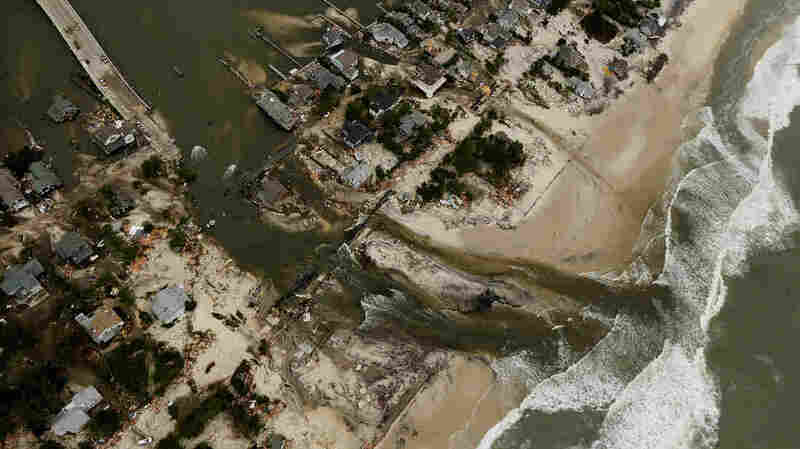 Sandy, in fact, wasn't such a powerful hurricane — "only" a Category 1 as it approached the shore. But a few coincidences made it freakish. Sandy hit the coastline right at high tide. It hit straight on, at a 90-degree angle. And the storm covered an enormous area. All that happening at once is pretty unusual. But William Sweet, an oceanographer with the National Oceanic and Atmospheric Administration, says there's one thing that will be part of every new Atlantic coast storm — a higher sea level. "Sea level is changing and it is going to keep changing regardless of who or what is causing it," Sweet says. "And the impacts are going to become more and more frequent and severe and we're going to have to deal with it." Sweet and his NOAA colleagues agree with the majority of ocean scientists — that if climate continues to warm, average sea level will continue to rise by as much as 2 feet more by 2050. That's because a warmer ocean expands in volume. Also, landlocked snow and ice will melt into the ocean. Sea level rise is higher on average along the Eastern Seaboard than most parts of the world because of wind and ocean circulation patterns in the Atlantic. And a rising ocean means that in the future, garden-variety storms will create the kind of flooding that big storms did in the past. NOAA says the type of storm you see only once a century or so now could hit every few decades by 2050 — and every few years if sea level rises as much as some computer models predict. "Storms of lesser magnitude and storm surges that weren't as high as Sandy will have more and more importance in terms of the way that we live our lives," Sweet says. One thing certain to change is the way people insure property against flooding. The federal National Flood Insurance Program requires most businesses and homeowners in high-risk flood zones to buy flood insurance. The Federal Emergency Management Agency administers the program and is now remapping those flood zones. And the new zones are a lot bigger. Robert Moore, who studies flood policy for the Natural Resources Defense Council, says New York City formerly had about 35,000 buildings sitting in flood zones. That number has now doubled. "The new maps that were made in the wake of Hurricane Sandy show a much larger flood plain that encompasses about 67,000 buildings," Moore says. The increase is due to changes in sea level up to now, and to changes in the built environment that shift the way runoff moves. FEMA, in fact, expects that the increase in flood risk areas and the number of people who live in them will continue. And that's without factoring in computer model predictions about the rise of sea levels in the future. One Year Ago: Homes in Mantoloking, N.J., sit in ruin at the end of a bridge that was wrecked by flooding from Superstorm Sandy. So, clearly more people are going to have to buy flood insurance. And insurance will cost more. That's because of a 2012 law that radically changes the flood insurance program. The law eliminates subsidies that have kept the premium rates for such policies artificially low for decades. Moore says that in some places, one-third of flood insurance policyholders have been getting subsidies. "We've been subsidizing people to live in some of the riskiest parts of the country," Moore says, "and that is one of the reasons the national flood insurance program is so deeply in debt." Once FEMA pays off damages from Sandy, the agency will be $25 billion in the red. Charging more for flood insurance would help mitigate that loss. But it's also a bitter pill for many. "There's a lot of pushback," Moore says. "People obviously have a little bit of sticker shock." There's been so much sticker shock that the law passed last year (known as the Biggert-Waters Flood Insurance Reform Act, after its main congressional sponsors) is already in jeopardy. This week, several members of Congress are proposing a bill to delay the insurance reforms called for in the Biggert-Waters act for as much as four years. Two other bills that would soften effects of the increased cost are in play as well. New Jersey Democratic Sen. Robert Menendez calls FEMA's new flood maps and insurance rates "a man-made disaster." "Many homeowners will be forced to pay premiums that are several times higher than the current rate they pay," Menendez says. Now, raising premiums was exactly what last year's law was expected to do. So apparently the new debate will be: How do politicians bail out FEMA without raising the rates of the people who vote them in — or out — of office?